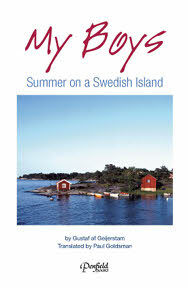 My Boys is the story of a Swedish family’s summer vacation on an island in the Stockholm Archipelago, based on the author’s vacation with his own family in the 1890s. It is “a summer book for big and small,” a book of lightness and gentle humor, and a departure from Gustaf af Geijerstam’s usual serious literary work “writing silly and boring books that little children could not read” (as he says in the book). Early reviewers recognized My Boys as a classic that both children and adults could read with pleasure.